carly tee: right at home + so many reasons to love the MISTI! right at home + so many reasons to love the MISTI! Happy Tuesday friends! 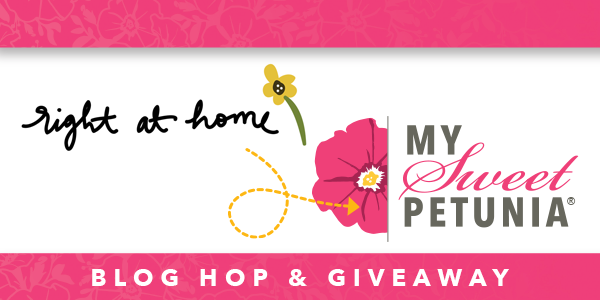 I'm thrilled to be included in today's hop with the My Sweet Petunia and Right At Home teams, basically a bunch of crazy talented people! You should be arriving here from Chris Dayton's blog. The MISTI has really changed my card-making life! I strive to be clean and precise in my crafty efforts but at heart, I'm really more of a messy-bessy type...think accidental smudges, lots of mis-stamped images and so much wasted cardstock. The MISTI has really helped me and I use it almost exclusively to stamp(my acrylic blocks are getting dusty). With the MISTI I get perfectly stamped images because I can re-ink and stamp again. It's also much easier to evenly space images & sentiments, use layering stamps and more. The MISTI is the most used tool in my craft room by far! Today I was inspired to create using an idea from the amazing Lydia Fiedler, marbling with the MISTI. I was going for a tie dyed look and if you let your eyes go fuzzy for a minute, I nailed it, LOL! One more thing before I tell you a little bit more about my "tie dye", there are prizes today! Two commenters will win their choice of a MISTI or Mini MISTI AND a prize package from Right At Home! So make sure to leave comments at each stop on the hop before September 8th at noon CST. The key to this technique really is the MISTI and the ability to layer color. The Right At Home Abstract Florals is perfect for this technique because it has great solid floral stamps and also a playful design. I started by choosing 3 colors of pigment ink, a light purple for the base, a darker purple & a blue for accents. Leaving your stamp & cardstock in the same place (this is the magic of the MISTI), add the next color of ink directly to your stamp with plastic of some kind. I used a little piece of plastic wrap. The crinkles of the plastic help create texture. Add a third color and continue to add ink and stamp until you are happy with the results. I think this technique is so pretty and fun! And it's a little like tie dye right? Haha! I might need more practice but I love it as background and to create a floral coffee cup (with a little masking) using the Right At Home Cup Of Joy and How Have You Bean sets. Thanks so much for stopping by and keep hoping over at Stephanie Severin's blog. Below is the complete list in case you get lost & have a great day! That Tie Dye effect is so awesome ... makes me want to go tie dye all my solid images. That is gorgeous! I appreciate you sharing the top. Thank you! Wow - your inking technique is awesome. Thanks for showing us how. Gorgeous flowers! I have never seen the Tie Dye technique - thank you for the informative how to! Both of your cards are fabulous. Oh that Right at Home coffee set is too cute! Love that tye dye effect so cool, Right at home used to be a 15 min drive for me to visit their store, i miss it so much since they closed, I NEED A MISTI SO BADLY!!!! Thank you so much for sharing your technique on this beautiful card and for the info on the MISTI. I've not used one yet and am soaking in the knowledge from all of you AMAZING ladies! Thank you for sharing in this blog hop! Interesting technique for this unique card! What a great technique!! your cards are beautiful. Nice technique? Thanks for sharing. Beautiful flowers! I love the color combos you came up with! Pretty 'hello' card, and I love the decorated coffee cup! Really neat technique. I'll have to try that soon! Thanks for sharing! This is such a cool technique Carly. I haven't really seen this technique done on cards before and it is awesome. A great job y dear! Wow, love the get down and dirty stampin' that makes the misti the tool that is must have. Great Job! This is So Cool! Thanks for showing us your imaginative new technique. Maybe impossible without the Misti....I love mine! OH what a cool technique, pretty card, thanks for sharing! I haven't seen the tie dye technique before. Very cool. These flowers are so beautiful! Thank you for showing us how you created them! I have pinned this so I can try the technique myself! Wow wonderful technique. The design has turned up so well. Thanks for the inspiration. What a fun technique! Thank you for sharing! What a cool technique--love it! Carly you are a girl after my flower-power heart!!! Tie-dyed? What a clever technique, that's totally new to me - thanks for sharing Lydia's fun with us - no need to let anything go fuzzy! Very fun technique - will have to try this one ! That flower stamp really is great for this look ! Thanks for sharing ! So cute,cute!I want to try this now! Great job and lots of fun!Love the way you designed everything together!Thank you for sharing! I love the whimsical look of the flowers in this set. Thank you for inspiring us. Wow!!! Your cards are really gorgeous!!! Love yuor technique!!! Awesome technique. Love your card and thanks for sharing the color combinations too! So beautiful; thanks for sharing that technique. I've never seen it before. Gorgeous! Love this technique. Thanks for sharing. How pretty! Love the lightness and brightness of your flowers! I love these flowers ! Adorable !